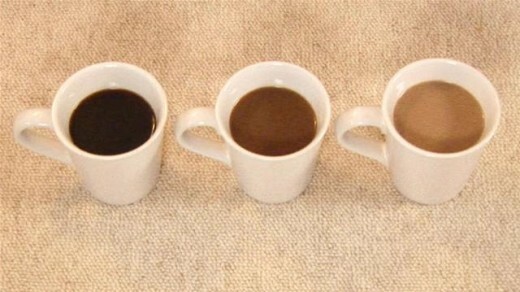 Any real coffee lover is all too familiar with the drips and brown rings from coffee stains. Whether the stain be on your clothes, newspapers, desk, or discover the brown rings left on the coffee table; anyone would agree it’s not an easy stain to remove. Once in a while, the unlucky coffee drinker will spill their coffee on the carpet. This most often causes panic! Like most stains, speed plays a crucial role in the success of the stain removal. fainling to clean up the spill while it is still fresh can lead to permanent stains as a result of the liquid seeping into the fibers of the carpet. If you are a coffee with cream kind of person… This especially applies to you! 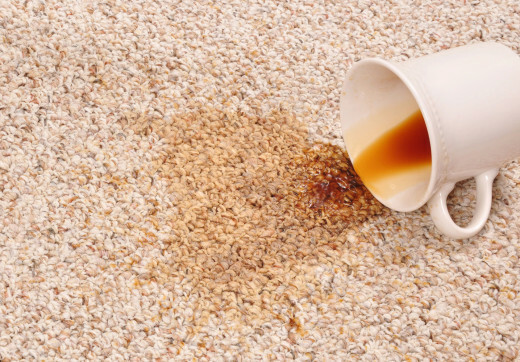 The cream and sugar can lead to bacterial growth in the carpet as well as an unpleasant smell. These tips will prevent these accidents from becoming a permanent problem. There’s no time to waste, let’s dive into how to remove a coffee stain! If it is a rug that is very old, a collectable, or very delicate, we recommend calling a professional cleaning service immediately. They will have better success cleaning the carpet without damaging the integrity of the rug. If you are able to clean the carpet yourself, use a test spot to test out cleaning products. If the test spot leads to a success, proceed to the rest of the stain. By using simple household products such as, 1-teaspoon of liquid dish washing detergent, and only 2/3 a cup of warm water, you can create an incredibly beneficial cleaning agent. If needed, you can substitute the dish detergent for 1/3 a cup of vinegar. If the coffee contained cream and sugar, we highly recommend using an enzyme laundry detergent to reduce bacterial growth. Mix these ingredients together and apply with a spray bottle or sponge. Use a clean towel or rag to blot up the stain until the spot is dry. Repeat this process until the stain is removed. If the stain still remains after several attempts, we recommended calling the professionals at SteamPro Carpet Cleaning. If the stain has been successfully removed, apply clean water to it and blot it up. To reduce moisture on the clean spot, place a towel, or rag on the spot to absorb remaining liquid. We recommend weighting the rag down with a book or heavy object to help absorb as much as possible. Old stains are much more difficult to remove once they have settled in to the carpet fiber. This is why speed is such an important factor when tackling stain removal. Clean it as soon as possible! Keep tabs on the stain spot to ensure bacterial growth has not occurred, especially in cases of coffee with milk. And remember, if you’re still struggling to remove the coffee stain, or you’re afraid that you may accidentally damage your expensive rug or carpet, give us a call at SteamPro Carpet Cleaning in Osage Beach MO. We service the Lake of the Ozarks area and would be happy to help you with your osage beach carpet cleaning needs!